Vieux Carré means “old square” in French. It also happens to be what they called New Orleans’ French Quarter back in the day. So when Walter Bergeron invented this cocktail in the 1930s (while tending bar at a hotel in the French Quarter), it was a no-brainer to name it after the Big Easy’s oldest and most famous neighborhood. The watering hole where Bergeron worked is now called the Carousel Bar. And yes, it resembles (and revolves like) a carnival carousel. If you’d like to ride the painted ponies, but can’t make it to Nawlins right now, no worries. Just mix up a Vieux Carré Cocktail—and take your palate for a spin. 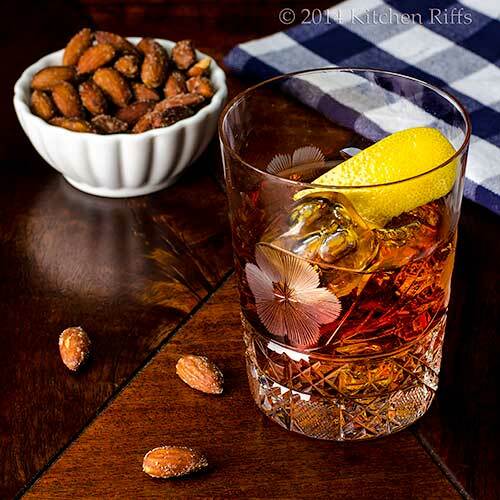 The Vieux Carré is an enticing blend of rye whiskey, cognac, and sweet vermouth, livened up with a splash of Bénédictine liqueur and dashes of two different kinds of bitters. It rather resembles a Manhattan Cocktail—but may be even better. You won’t find the Vieux Carré Cocktail listed in many cocktail books these days, alas. But thanks to Chuck Taggart at The Gumbo Pages, word is getting out. My recipe is very slightly adapted from his. Add all ingredients (except garnish) to a mixing glass half filled with ice. Stir with a long spoon until chilled. 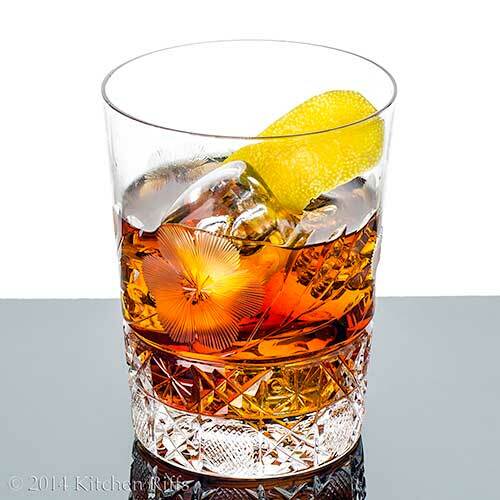 Strain into an old-fashioned (rocks) glass filled with ice. (Or use a cocktail glass—sans ice—if you prefer.) Garnish with a twist of lemon, and serve. Why stir this drinking instead of shaking it? Because all the ingredients are clear—and stirring keeps them that way. When you shake a cocktail, you introduce oxygen into the mix, which clouds the drink. That’s OK when the ingredients are opaque anyway (like citrus juice), but less desirable when they’re see-through. Of course, if some cloudiness doesn’t bother you, feel free to shake away. When using rye in mixed drinks, I prefer a fairly high-proof version that can stand up to the other ingredients. Both Rittenhouse Bottled in Bond and Wild Turkey 101 work wonderfully well in almost any cocktail. Old Overholt, while not as high-proof, also is a good mixer (and easier on the wallet). There are many great boutique ryes on the market these days that are wonderful over ice or sipped neat, but I don’t like them as well in cocktails. Your mileage may vary, of course. You can use either brandy or cognac when you make this drink. Brandy is what happens when you distill wine; cognac is brandy that is produced in the Cognac region of France. I tend to prefer the flavor profile of cognac, so that’s what I usually buy. But there are some great American brandies available at moderate prices. People often think of cognac as expensive stuff served in a snifter, to be enjoyed after dinner. Although you can buy very expensive cognac that is ideal in that role, you wouldn’t want to waste it on cocktails. Bénédictine is an aromatic herbal liqueur. Based on the name, you might assume that it’s produced by Benedictine monks. In fact, it was invented in 1863 by Alexandre Le Grand, a French wine merchant and industrialist. Le Grand did, however, boost sales by claiming that monks at a Benedictine Abbey in Normandy had developed the beverage. You’re probably familiar with Angostura bitters (they’re the one brand of bitters that every liquor store stocks), but Peychaud’s Bitters may be new to you. These bright-red bitters are anise flavored, with hints of clove and nutmeg. Any high-end liquor store should carry them. If yours doesn’t, maybe it’s time to find another liquor store—or order them online. This drink just isn’t the same without them. The Vieux Carré Cocktail isn’t the only New Orleans original we’ve written about. There’s also the Sazerac and the Hurricane. And although not native to the city, the Pimm’s Cup, the Old-Fashioned, and the Mint Julep are also popular in New Orleans. The creator of this drink also isn’t the only barkeep named Bergeron we’ve written about. There’s also Victor Bergeron (better known as Trader Vic), who invented the Mai Tai, that greatest of all Tiki drinks. Were Walter and Victor related? We have no idea, but it’s an interesting coincidence. The bar where Walter Bergeron mixed up the Vieux Carré (in the Hotel Monteleone on Royal Street in New Orleans) originally was called the Swan Room. The hotel later decked out its bar as a carousel and renamed it. The Carousel Piano Bar & Lounge (to use its full name) rotates once every 15 minutes. Programming Note: For the past couple of years, we’ve regularly published two posts a week on Kitchen Riffs, every Sunday and Wednesday. Going forward, we’ll be posting regularly only on Wednesday (once a week). There will still be plenty of weeks with multiple posts, but not as many as in the past. If you’re worried about missing a post, you can find links on this page for subscribing to Kitchen Riffs by email or RSS feed, and for following us on Twitter and Facebook. Just point your cursor to the top of the sidebar on the right, and click on your choice. Well, if not, it wasn’t for lack of trying. Hi John, I'm back after a short break. That's a very nice and refreshing cocktail. Thanks for sharing. Your pictures is excellent and very impressive. 2 thumbs up for you. Catch up with your other posting later. Have a nice day. Hi Amelia, glad to see you're back -- I'll check out your blog today. Thanks for the comment. I will try to find that bitter and make this for my hubby. Your glass looks great by the way! I'm always in awe of your beautiful cocktail photos!!! Love..
What stunning photographs! And I adore that gorgeous glass. Hi Ilke, your husband will like this! I love that glass -- it's from my great, great grandmother and over 100 years old! Thanks for the comment. Hi Kiran, it's a challenge to photograph cocktails, but so much fun! And drinking them is even better. ;-) Thanks for the comment. Hi Rocquie, that glass really is pretty, isn't it? Thanks for the kind words, and for taking time to comment. Love the glass too! Just perfect for a cocktail from the old south. I bet this one packs a wollop! I think this one would knock me on my kiester, but it is gorgeous!!! 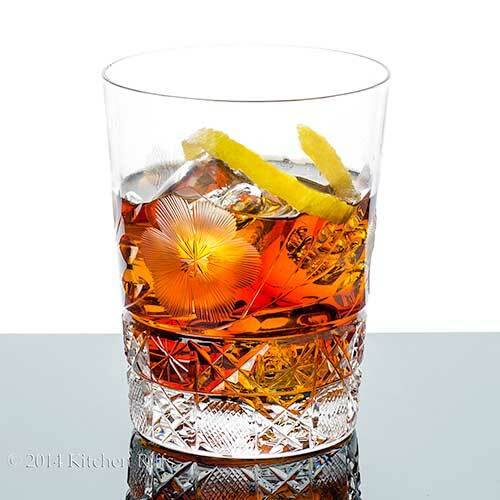 The Vieux Carré Cocktail sounds very delicious and looks elegant in your beautiful glass! We so enjoy your cocktail histories and tips. Hi Karen, this drink is a bit hefty. One of those where one is plenty! Thanks for the comment. Hi Liz, this does have a bit of alcohol to it. You could easily make one, though, and share with someone. Thanks for the comment. Hi Juliana, this is one of those drinks where one really is enough. ;-) Thanks for the comment. Hi J+C, it's a great drink. Glad you enjoyed the post, and thanks for commenting. Hi Ashley, isn't that a great glass? And the contents are even better! Thanks for the comment. Before I forget, I just remembered today is Absinthe Day! Whew! I do believe if there is any carousel riding to be done I would much rather be doing it drinking this classic drink, John. It's a new one to me and I just love new drinks! Your clicks are as gorgeous as ever and of course what would a sip be without a bit of conversation:) I'll be missing your Sunday posts but there's always Wednesday and those surprise posts in between! A classic beautiful cocktail, John. I love that glass too! Only you, John, to take such pretty photos of drinks...This is beauty in a glass! I have to have this!! Stunning Photos! Off to tell the guy to read this up and make some drinks ! Thanks for sharing a wonderful drink. Hi Louise, how could I have missed Absinthe Day?! ;-) This really is a delish drink - so worth trying. Thanks for the comment. Hi Lizzy, that glass is definitely a winner. As is the drink! Thanks for the comment. Hi Denise, this is rather pretty, isn't it? Thanks for the kind words, and comment. Hi Ansh, you really do need this! Enjoy. ;-) Thanks for the comment. Hi Uru, deliciousness is definitely the way to describe this. And gone, once you start drinking it. ;-) Thanks for the comment. I learned so much today. Shaken vs. stirred for example. So, the Carousel is still open?? We plan on being in NOLA soon and I will have to seek it out so I can commune with the spirits of these great American authors (and have a cocktail). I want this, but only if I'm in the Big Easy! Looks good John, and sounds like you are taking a bit of time for yourself. I'll miss you though. Hope you are doing something good and fun! As much as I hate to sound like everyone else, but that glass is pretty darn cool. You're so smart about this kind of stuff John. I always learn a lot from you. I love that glass, so pretty! Hi Debra, yup, the Carousel is still open. And the hotel where it's located (Hotel Monteleone) is supposed to be pretty nice. Do let me know if you make it to the Carousel -- it'd be fun to have a report! Thanks for the comment. Hi Nee, I'll definitely be showing up for your birthday party (Louise's too!). So fun we all share the same birthday. ;-) Thanks for the comment. Hi Abbe, I am dialing down the blog a bit, at least for now. So many things I want to do, so little time! Thanks for the comment. Hi Dawn, I think half of cocktail photography is actually the drink and the garnish! And of course the pretty colors of the drink itself. ;-) Thanks for the comment. Hi Chris, glad you enjoy yourself here! I sure enjoy writing these posts! Thanks for the comment. Hi Zoe, this drink would certainly help you chill out! It's really great. You might say it sparkles. ;-) Thanks for the comment. Hi Victoria, the glass came from my great, great grandmother. Where she got it, I have no idea. ;-) Thanks for the comment. That glass is stunning - is it an antique? It looks like it! That is so beautiful! Kudos! What a beautiful drink - and glass! I love this photo very much. It's a good point about stirring, not mixing. I never thought of it. Your recipes have full of useful and detailed info. Very fun to read and learn! Se ve preciosa la bebida y bien servida una maravilla,abrazos. Is it happy hour yet??? And love that glass. Beautiful. John, you have a great looking cocktail here, and I love the history behind it. It's been pinned for good measure...cheers! I want those glasses! But please ship them with this drink included. :) Have never had a vieux carre, but I certainly love the sound of it, especially once you threw in the Benedictine. I probably would use 1 tsp. because I like like my whiskey a little sweet. Great drink John!! Hi Alyssa, the glass is indeed an antique -- well over 100 years old! Some of them are a little chipped, but overall in pretty good shape. Thanks for the comment. Hi Pat, thanks so much for those kind words, and for taking time to comment. Hi Nami, I'm always happy to share what little I know! Thanks for the comment. Hi Charlie, this is the perfect glass for drinking a whiskey! Thanks for the comment. Hi Rosita, isn't this a great looking drink? Thanks for the comment. Hi Lea Ann, it's always happy hour somewhere! ;-) Thanks for the comment. Hi Brooks, this really is a great drink. Glad you enjoyed it! Thanks for the comment. Hi MJ, it's always better to ship glasses full rather than empty, isn't it? Less chance of breakage that way. 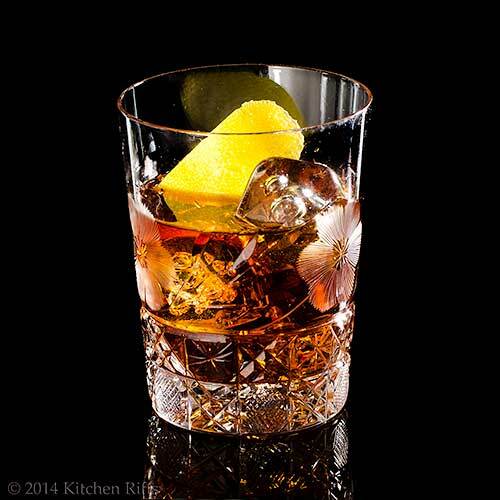 ;-) I know you like an Old-Fashioned from time to time, so I'll bet you would like this just a little bit sweeter. One teaspoon would probably be perfect. Thanks for the comment. Beautiful pictures and lovely cocktail! Those glasses are so pretty. Hi Rosa, glad you liked it! And I love those glasses. ;-) Thanks for the comment. I have never made a cocktail before, and I definitely want to make one soon. This looks great! Hi Cathleen, this is a good drink! And if you like rye, you'll love this. Thanks for the comment. So interesting on the reasoning behind stirring vs shaking. Also, I love those glasses. Very fancy. Once again I am amazed at your ability to photograph the cocktails! When I saw this picture, I could literally picture a room filled with smoke from cigars, the plates of grilled steak with gorgonzola cheese on top - just a good old cozy, dark atmosphere of a traditional steak house. :) Wow! Lol! I agree, Hemingway drank in every bar!!! I always enjoy your literary references. Sounds like the Carousel Bar was well-loved. I'll miss your twice-a-week posts, but am happy you'll still be blogging! Hi Laura, I often shake things that "should" be stirred, but clear drinks do look better stirred. Thanks for the comment. Hi Julia, it's all the glass. Or the camera. One of the two. ;-) Seriously, thanks for those kind words, and for taking time to comment. Hi Julie, spicy in that bitters add a bit of spice to drinks (seasoning might be a better term). Thanks for the comment. Hi Beth, no danger of me quitting blogging! And the literary references are always fun (but then, I like to read). Thanks for the comment. Hi Maureen, those hurricanes can be a bit dangerous, can't they? Fun drink, though. But this is a bit better, IMO. Thanks for the comment. I'm not a drinker but I'm sure my husband will love this. Thanks for sharing, John. Hi Peachy, hubby will enjoy! Thanks for the comment. Hi Carolyn, this really does have an interesting flavor -- definitely worth a try if you're in the mood for this sort of drink. Thanks for the comment. Hi Terra, this drink is definitely on the hefty side. But awfully good! Thanks for the comment. Hi Candy, my feeling exactly! :-) Thanks for the comment. Oh, I love this cocktail! Rye whiskey and Benedictine gets me every time. Hi Jessica, doesn't Bénédictine add such nice flavor? It pairs so well with rye. Thanks for the comment. As always, you have created a beautiful drink! Hi Pamela, glad you like it! Thanks for the comment. Hi Bam, it does indeed take a bit of time to get through one of these drinks (or at least it should!). And it really does have a great flavor. See you next Wednesday (Thursday!) and thanks for the comment. Wow! This drink is definitely a sipper, no downing this one. I love the presentation. The glass and the color of liquor is so pretty together. What a beautiful glass for this drink! This would be a great way to get in the New Orleans state of mind without even leaving home. Hi Kristi, this drink really is kinda hefty, so you're right that it's a sipper. Awfully good, though. ;-) Thanks for the comment. Hi Lisa, you're right about getting into the New Orleans state of mind while drinking this! There's a book in there somewhere -- The Moveable Glass maybe? Or maybe not. ;-) Thanks for the comment. Hi Greg, isn't this a great cocktail? There are an awful lot of cocktails that can be improved, but this one would be hard to. Thanks for the comment. So, I waited on Sunday for your new post and nothing appeared. Then I realised I hadn't come by for this post and upon reading found out you are doing only one post a week! I see the time is getting the better of you too! I'm so far behind it's not even funny. I can't seem to catch up and that's only doing one post a week myself. Oh well, if I could drink, I'd down a few of these :) It looks gorgeous. Wow John this cocktail looks beautiful but I'm guessing it's way too strong for me. One sip and I'd probably be drunk. It's difficult posting 2-3 times a week. So far this year I've had so much going on that I'm finding it difficult at times to take in 2 posts. I will look forward to seeing yours on Wednesdays. Hi Nazneen, there's so much to do, isn't there? And my blog is a hobby, so rather than frazzle myself it seems easiest to cut back, at least for now. One of these days we both may be posting multiple times a week (but don't hold your breath!). ;-) Thanks for the comment. Hi Vicki, this is definitely one of the stronger drinks I make. Worth trying a sip at some point, if you have a chance. And life can really get crazy sometimes, can't it? I have a much more flexible schedule than most people, and I still run out of time! Thanks for the comment. Hi Gintare, that sounds like a fun idea! I'm sure you'd have a great time.. ;-) Thanks for the comment. Okay so odd little fact about me, I'm a carousel junkie. Not even kidding, love them so very much. I stopped by to see the drink and then smiled from ear to ear to read about carousels. I must see this place John. I had no idea such a place existed. I need to go there, order a drink as fancy as this and cross another adventure off my list. You photos and recipes are stellar as always. I've never met someone who photographs glass as well as you. Blimey that sounds like quite a concoction! Nice story to go with it too. Hi Kim, I haven't been to the Carousel Bar, but it's sounds like fun! Thanks for the kind words, and for taking time to comment. Hi Caroline, although I certainly enjoy the cocktails, in many cases it's their stories that I find more interesting. Thanks for the comment. Hi easyfoodsmith, even if you don't drink, cocktails are fun to look at, and so many have great stories. I got interested in them years before I started drinking them (I used to be primarily a wine and beer drinker). Thanks for the comment. wow! great cocktail! thanks for the history! Hi Sarah & Arkadi, isn't this great? Wonderful flavor, and the history is fun. Thanks for the comment. Hi Minnie, I really like the way this drink looks too! And even if one doesn't drink liquor, it'd be a pleasure to watch someone sip this. ;-) Thanks for the comment. Beautiful presentation. This one sounds like a sipping kind of cocktail. Hi Dawn, this is a pretty heft drink, so I agree sipping is probably the best option. At least that's how I drink it! Thanks for the comment. I love your cocktail posts John. The history behind cocktails is so interesting... so many that I've never heard of too (and always accompanied by such striking photography! Love that glass!). I'd like to give this one a go. My husband's a big fan of whisky based drinks (and ones that give you 'your money's worth' in terms of shots!) so I think he'd love it. Hi Laura, I'll bet your husband would love this -- loads and loads of great flavor in this drink. He'll definitely get his money's worth! Thanks for the kind words, and for taking time to comment. Very nice, how much? :) - I meant the drink and the glass! ... Please o please be my neighbor, John. Please! Hi Nusrat, it's be fun to be neighbors! We could swap great food and trade tall tales! This is a super drink -- worth trying sometime. Thanks for the comment.